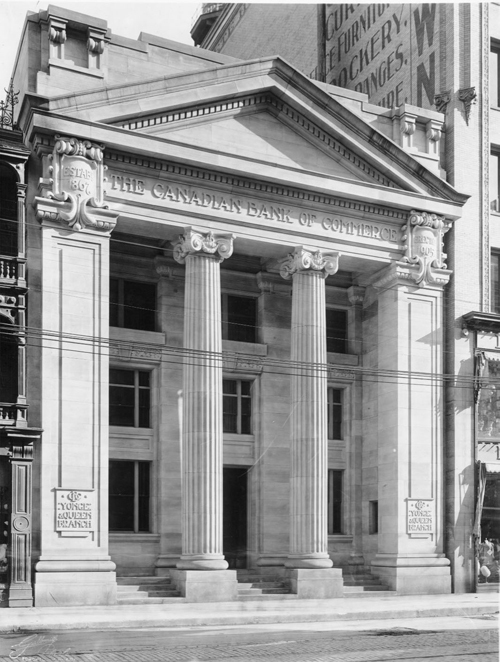 The former Canadian Bank of Commerce building at 197 Yonge Street, since abandoned for 25 years, is set to become the focus of a major redevelopment effort led by MOD Developments in collaboration with ERA. Redevelopment will see the restoration and integration of the existing stone edifice at the foot of a new mixed-use tower designed by Hariri Pontarini Architects. The illustrious stone frontispiece, designed in 1905 by Darling and Pearson, stands as a wonderful example of turn-of-the-century Beaux Arts classicism in Toronto. To this day (and in spite of its long derelict status) the building manages to turn the heads of city-dwellers and tourists alike. Over the coming months ERA will oversee the gradual transformation of this widely revered local landmark into a grand lobby space for the new residential development. Though many of the interior spaces have been altered significantly over the years, there is still much inside to be celebrated — from the raised wood paneling and carved oak cornice lines in the front lobby, to the intricately detailed plaster ceilings in the office spaces; things are definitely looking up for this long neglected piece of the city. See the press release from MOD Developments here.